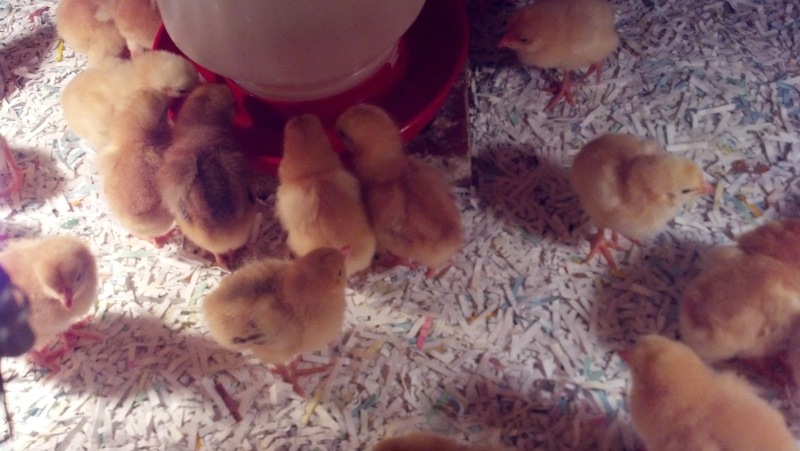 We got baby chicks in today! It's so much fun when you go to the back of the post office before daylight and ring the bell. While you wait out in the chill of the morning, you soon hear these little chirp, chirp, chirp, chirps.... There soon comes one of the postal workers with a small box of noisy baby chicks. You can't see them, but there is no doubt that the package contains baby chicks! When we got home, we quickly opened the package and began pulling out the tiny little chicks. As each bitty is brought out, they have their beaks are put in warm sugar water. We count each one to make sure they make the trip from Pennsylvania. Today, we had 31 chicks....just like the invoice said. Once they got their first drink, they started exploring. They moved all around. Watching them, we could tell they were figuring out where the warm spots were to curl up in and where the spots were to cool down and scratch around! After watching them for a few minutes, we put the covers on and felt good about leaving them. Around mid morning, Stacey went to check on the bitties. As the top came off, so did the wave of heat. The baby chicks had moved away from under the heat lamps to the sides of the brooder. So he put the lid back and lifted the cover up to release the heat wave that had built up. The bitties were still moving around and drinking just like happy little chickies should! When we got there, it was obvious that we had a major problem. Two bitties were all that were moving around. The rest were gone...dead...the cute little creators that had made the two day trip here were there totally lifeless. 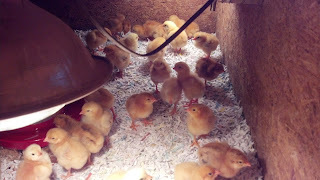 These noisy, yellow balls of fluff were quiet, flat, cold bodies on the floor of the brooder. In the Spring of 2013, K and H Farms will be offering pastured pork. Our pigs are grown on our pastures, woodland, and gardens. They eat nuts and acorns, root up our garden, and eat grass and other weeds while enjoying the fresh air and sunshine. You will find our pork to be much healthier and happier than the average pigs with much leaner and tastier meat. Our pigs are fed grains, corn, minerals, and food scraps but get between 20 to 30% of the nourishment from the pasture, gardens, and woodlands they live on. They are moved to new areas every two to three weeks. These pigs will yield truly leaner cuts of meat. Their flavor is richer and more vibrant than those bought in the grocery store. This is pork that we proudly put on our own dinner table! 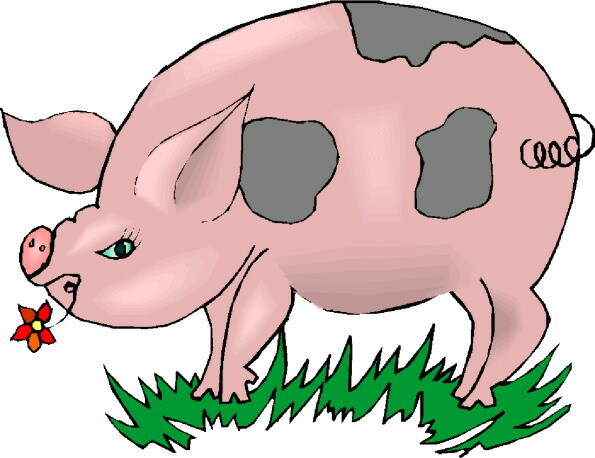 Starting the Spring of 2013, K and H Farms is going to offer Community Supported Agriculture (CSA) to our friends, family and community for our pastured pork! This allows you to own your “share” of our pigs. You pay upfront a deposit to secure your “share” of pork. The “shares” will be quarter, half, or whole pigs. *Payment for CSA needs to be paid in full before your “share” is taken to be processed. Payments can be made through cash, check, PayPal, or credit card. You will be allowed to pay for your "share" in three installments with PayPal. These installments must be paid before your "share" is delivered to the processor. All pigs will be processed at Oak Valley Meat Processing (706-886-8556). This is a USDA inspected facility. You must contact them before the meat is delivered to work out how you want your “share” butchered. You will then pick up your "share" directly from them. Deliveries to another processor will be the customers responsibility. If you choose another processor, you must pick up your live hog the same day as we deliver to Oak Valley Meat Processing. It will take 4 to 6 months for the hogs to get to market weight. We have not set a slaughter date as of yet. This date will be set after your deposit has been received. We encourage you to go in with others to split "shares" especially if you do not have freezer space. You will be allowed to pay for your "share" in three installments. These installments must be paid before your "share" is delivered to the processor.